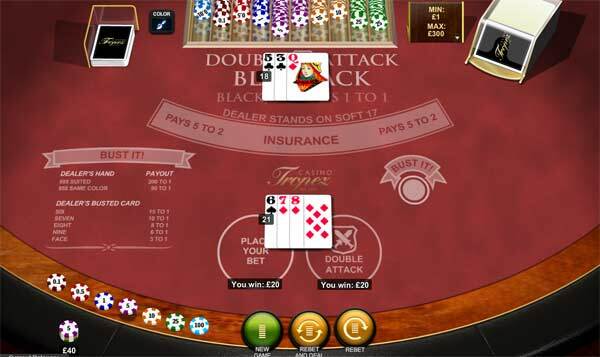 Double Attack Blackjack has been developed by Playtech to add a new dimension to a hugely popular casino game, both at online casinos and those that are land based. For starters with this game the players gets the option to double their stake after seeing the dealers first card. This allows the player to make a judgement on whether a bust is likely or not and increase their gamble accordingly. Another bizarre fact about this game is that it is played with 48 decks and every deck has all the 10 cards removed. This reduces the chances of blackjack to compensate for the players ability to double the wager before their own cards are dealt, but after seeing the dealers first face up card. In this game there are the standard extra features that include double or split. You can of course only double once. There is also a surrender option. The game also has a "Bust It" side game. you can place a stake on this side bet on what cards the dealer will receive. You can get paid for a dealers to cards being the same suit or the same colour when the bust. You can also get paid if the dealer busts and get a payout of up to 15 to 1 if the dealer busts with a 6. We have many special exclusive promotions available at the worlds best online casinos. These allow you to play many different versions of Blackjack for fun or for real money. 888 CASINO are offering new players $88 FREE PLAY to try all their games, you can keep your winnings, subject to maximum amounts and wagering requirements, and you can get a bonus on your first deposit. Our best casino for accomodating players from within the USA is GRAND PARKER CASINO. At Grand Parker they have some great games and offer some of the best promotions and possibly the biggest Blackjack bonus available anywhere. If you want to play Blackjack for real money thn you can get a cool 125% deposit bonus on each of your first four deposits. Deposit $1,000 each time to get $1,250 in free bonus cash. Do this four times to have a $5,000 windfall.